To say esports is booming would be an understatement. Esports, or electronic sports, is the term used to describe the sport of competitive video game playing. 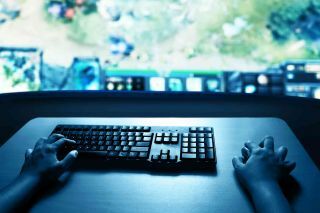 The world of professional esports has exploded over the last few years and is expected to reach nearly 5 billion in value and a global audience of nearly 600 million people by 2020. Last year, the second most watched sporting event in America after the Superbowl was the League of Legends finals. Three of the top ten most watched sporting events last year were esports events. By 2020 esports will be the second most watched sport in America, second only to football. Every teacher’s favorite game, Fortnite, just announced they’ll be putting 100 million dollars (about two weeks of revenue!) into their esports scene this year as it brings competitive Fortnite to their 125 million players in 2019. Esports, like Fortnite, isn’t going anywhere. The professional esports scene has never had more players, events, prize money, or a bigger audience. Esports has passed the tipping point. Esports is here to stay and teachers should not only care, we should be excited. Thanks to the passion of students and the support of the video game industry, esports is also finding a home in higher education. Currently, more than 475 of the nation’s colleges now support esports at the club level, and an estimated 50 schools provide a total of more than $9 million in scholarships to talented gamers. Colleges are offering full rides for esports games like Overwatch, CS:Go, League of Legends, and more. Next year, the popularity and opportunities in esports will only continue to grow by leaps and bounds. The Big Ten will launch its esports league next year, complete with a TV deal, along with 200 other colleges who will be launching varsity gaming at varying levels of competition. Chris Haskell, the esports coach at Boise State, predicts the number of colleges offering esports opportunities and scholarship may be as high as 450 colleges by 2019. And yes, you can now earn a Fortnite scholarship. In Jersey, even our state university, Rutgers, has an esports team now! To the delight of some, and dismay of others, the growth of esports at the college level is leading to the growth of esports at the high school and middle school levels as a the school-to-college esports pipeline develops. I can feel the eye rolls from those of you who don’t get it, so let me help you understand why esports in education is a good thing. I was a good high school athlete. I’ve played sports at the collegiate level. I’ve also coached varsity sports for ten years. I also enjoy playing video games on a competitive level. I’m pretty good at those, too. Having a foot in both worlds, I have no problem saying esports is as valuable to a student’s social/emotional development as any other sport. ESports athletes are athletes. All the social/emotional learning and soft skills I developed in football, wrestling, track, and rugby can be developed through esports. When I was chasing athletic scholarships for college, no one told me my it was a dumb idea. My family, teachers, and coaches did everything they could to help me get an athletic scholarship. Just like we don’t scoff at helping athletes find a home at the collegiate level, we shouldn’t scoff at helping hopeful esports students find a home at the collegiate level. To do that we need to build the school-to-college esports pipeline. Building the school-to- college pipeline is also important because it reaches a group of kids who often don’t have a home/school connection. For example, as I try to convince stakeholders in my district to let me field an Overwatch team next year, I have been polling my students. I have about 75 students, 6-8th grade, who want to be a part of our Overwatch esports team. Of those interested students, more than half have no after school connection to school. They aren’t involved in any sports or clubs. They just go home. The research is clear that involvement in extracurriculars at school lead to better student development and learning. Having an esports team is an opportunity to reach more students and let them know we value them and what they love. Esports is another way to let kids know they matter. You also better believe that we’ll be including grades and behavior expectations in the code of conduct my students write for our esports team. Being part of an esports team can motivate students to stay on the straight and narrow just like traditional sports can. In polling my students, I found another great reason to embrace esports in school. I asked students about other roles they may be interested in on the team. Get this: of the 75 students that want to come out for our team, almost a quarter of them don’t want to actually play the game. 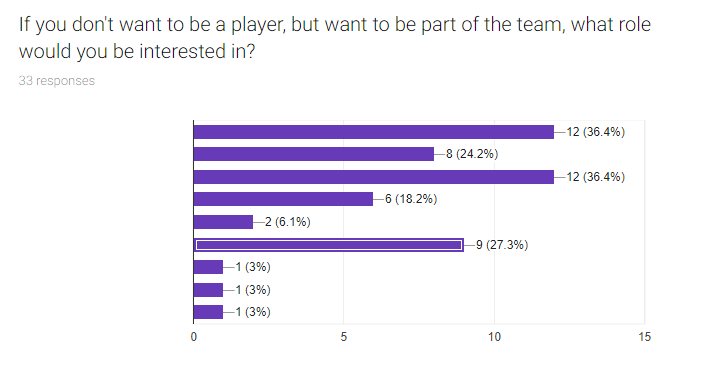 A quarter of my students want to develop the website, run the social media accounts, oversee the Twitch stream, run the in-game camera, manage team logistics, act as team journalists and videographers, and provide the color commentary and play-by-play of the games as casters. All of these tangentially related needs of an esports team will build soft skills and talents that our kids can apply to future college applications and lucrative jobs. If creating more opportunities for students won’t convince you to embrace esports, maybe the need to keep them safe will. There is a war brewing for our students. A host of startups are trying to win a piece of the esports-in-school pie. A startup, PlayVS, just closed a 15 million dollar round of funding to bring esports to high schools. No doubt esports in education will need infrastructure and a governing body to be taken seriously. While colleges seems to have settled on NACE for their needs, nothing is settled in the 6-12th grade esports scene. I’m not comfortable with PlayVS, or the host of other startups vying for market share, controlling esports for our students because I don’t know them. I don’t know if educators and students had a voice at the table while they are building their businesses plan. When they talk next steps for their company, who is there to represent and protect our students? Having educators get a seat at the esports table is important because they are going after our kids. By embracing esports, we can provide a level of protection for our students and hold these companies accountable since schools will be part of the scene. Finally, esports may be a useful way to address two important cultural issues: violence in schools and misogyny in gaming. To me, not all violence is created equally. I don’t support games rated M for Mature or realistically violent games in middle school or high school, but I don’t have a problem with games like Fortnite or Overwatch with their cartoonish violence being played in schools. I’ve talked to others who feel very differently. I see esports as an opportunity to discuss and educate students about violence in the age of school shootings. We also have the opportunity to address the misogyny found in a disturbing subset of gaming culture that has reared its ugly head in incidents like gamergate. Five girls want to be players on our esports team. One of them may be the next Maggie Borland (the video on this link is fantastic). I want to make sure the boys that come through our esports program embrace that idea as they become young men. I don’t have all the answers on this front, but I see esports as part of the equation. Within a ten mile radius of our school, we have at least three professional gamers who make a living playing video games. My kids love them and follow their every move. While going pro like the gamers they watch may be a long shot, we don’t stop our traditional athletes from dreaming that dream, why stop our esports athletes? Even if they don’t go pro, esports athletes will learn a lot and enjoy all the same benefits a traditional athlete gets from participating in sports and may even earn a scholarship or at least improve their chances of getting into a college along the way. We should care about esports because it is another opportunity for students to be successful and you know I’m all about opportunity. I have two students who are ranked near the top of the Diamond division in Overwatch. This means they are in the top 10% most talented players in the game. Who knows where they can end up with support. For my kids who are not in the top 10%, maybe they’ll find another thing, or the first thing, that makes them love school. To do all that, we need to build the school-to-college pipeline and embrace esports in education.